Semana Santa and the Feria de Abril are on their way. Welcome to Exploreseville, where you can find helpful information for the visitor, student or expat. I highly recommend you read the site guide to locate whatever you're looking for. If you're looking for pictures but don't have time for all the photo albums, you can take a quick photo tour of Seville. To keep you informed about what's going on in Sevilla check out the sections below for daily updates. For some ideas to explore Seville and beyond take a look at my side trips section for destinations close by, or the: "85 Things to do in Seville" for some fun. The list is growing, so soon it will hit 101 things! If you're wandering around Seville you can visit the market in Plaza de la Encarnación. It's hard to miss! The entire structure is finally finished including restaurants on the top level. Take the elevator up for a good view early in the day or later in the afternoon. You can browse the market and see a wonderful array of fruits, vegetables, meats, fish and more. The museum in the lower level is also up and running. There's always a flamenco show to see and in your down time the tapas bars and restaurants await you! Finally, I've launched a new Sevilla WiFi map, plus a hotel and hostal map which gives you more options than you will find on any other site! 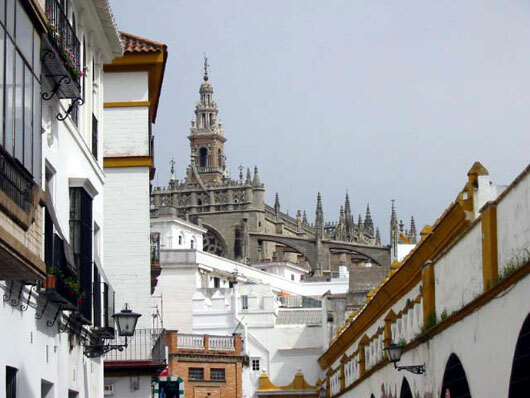 If you're looking to rent an apartment or find a hotel in Seville, check out the recently updated sections. I also recommend checking out sevilla5.com. Plenty of options from budget to the extravagant. - 85 Things to do in Seville! From 5 stars to budget - book online! It's that time of year again, as we enter spring and Seville is at it's best. Semana Santa is the first sign that the season has arrived, with the Feria de Abril just around the corner. Arising from my winter hibernation, I recently noticed on my way to work a large banner hanging over Calle San Esteban, advertising robes and capirotes for the thousands of nazarenos who will march through the streets of Seville. Joining them will be costaleros, floats, "marching" bands, and of course hundreds of thousands of people! The time has come, and for those of you visiting Seville you'll need some time to prepare. To help you get ready, check out my Guide to Semana Santa in Seville. Real Madrid came to town over Valentine's Day weekend, but there wasn't much love for the team in Seville. Entering as heavy favorites - Madrid has been dominating the league, far out in front of Barcelona, while Betis is at the other end of the table - the game turned into a nightmare for Real, and happiness for us beticos. Thorsten, my coworker, took some photos. Above you can see Palmerín, the Betis mascot, shaking hands with Raul before the start. The good thing about Seville is the two first division teams (well, the good thing is Betis), so you can catch a match just about every weekend: Consult the Betis and Sevilla combined home match schedule. From money to mobile phones, accommodations to the sites, or technology and the internet, you can read a little about it all here. You'll find some useful information as well as a few of my general observations on life and culture in Sevilla to help you understand some of the quirks and differences of life here. I've also included sections on tourist info such as transportation, shopping, nightlife (la marcha), hotels and hostals as well as where to buy food when you're sick of eating out. With some recommended books and helpful links I hope to assist those of you looking for more information on some specific topics. Finally, if you're looking for a more long term stay in Seville take a look at the living and moving sections. I frequent many tapas bars and restaurants in Sevilla, hoping to discover a few surprises hidden in the back alleys. I've also added international and vegetarian options. And with some recent work, the sections have been reworked and launched, with even more informatio. Soon to come: some photos and helpful tips on eating out. I've broken down the restaurants in Sevilla by neighborhood, but even if you don't know Sevilla that well you shouldn't have any problems locating these places with a map! And of course I've added a number of new places to eat and there are now over 60 bars and restaurants, from places for locals only (until you show up! ), tapas or a complete meal.